No shade, really, against packaged hummus from the supermarket. It’s easy, convenient, and cheap…ish. But I’m here to make the case for something else, something even cheaper, and—get this—even more delicious: homemade hummus. By no means am I breaking ground here. The chickpea spread has been eaten across the Middle East for centuries, much of it homemade. Though its exact origins are murky, hummus’ many iterations can be tasted from Egypt to Turkey, and it’s all very, very good. In recent years, however, the spread has made its way into North American supermarkets in a big way. We watched hummus shift from novelty to norm and now, all of a sudden, people are eating it on everything—in every which way. 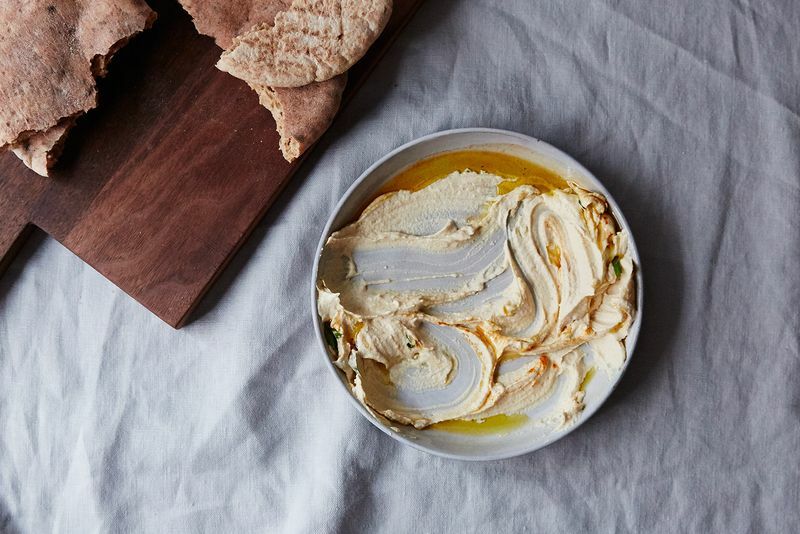 Most people I know keep a tub of hummus in their fridge, usually Sabra—and why shouldn’t they? It’s filling in the best way and works on so many levels. But I say it’s time to ditch store-bought and break out the food processor because homemade hummus is the power dip-spread-snack-breakfast-lunch-dinner we all need more of in our lives. Half of you already make your own hummus, I’m sure, and the other half of you might be wondering why you should put in more effort than you have to. You’re right—you are, totally. Buuut where would I be today without the silky, olive-oily smoothness of a fresh batch of hummus? The answer, ladies and germs, is nowhere. At its simplest, hummus is but chickpeas, lemon, tahini, salt, garlic, and olive oil blitzed in a food processor. When I’m lazy or in a rush, I’ll serve some amalgamation of these ingredients, varying the proportions to my mood. I’ll slather it on vegetables or across bread or serve it in a bowl as an appetizer and guests usually always think I’m awesome for it. Homemade hummus is cheaper, too. A 10-ounce container of Sabra at Walmart will set you back $2.98. On Amazon, the same tub comes in at $3.29. Although making hummus at home will cost more upfront to buy all the ingredients, the long term yield most definitely pays off. All of this—plus some salt and a glug of olive oil, which I’m assuming most everyone has a bit of somewhere in their kitchens—comes out to $5.41. Yes, that’s more expensive than the store-bought 10-ounce container. BUT the yield is much greater: A can of chickpeas will give you more than 20 ounces of hummus, so no matter how you spin it, you’re saving. Are you a maker of hummus at home? If so tell us why you love it in the comments below. ← Start Your Morning Clean: Soft Boiled Egg + Avocado Toast!